It is not a river for the fledgling rookies in doubles. 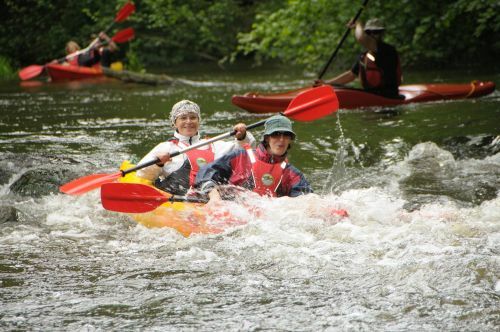 Only starting from the village of Kamieniec they could try their chances in a double kayak but only at high water levels. Apart from that the river is suitable for single canoes and canoeists with experience. This section can discourage novices and even scare them off. Especially the section from hydroelectric power station to trout farm in Kamieniec is very fast and varied with trees and rocks protruding from the river. 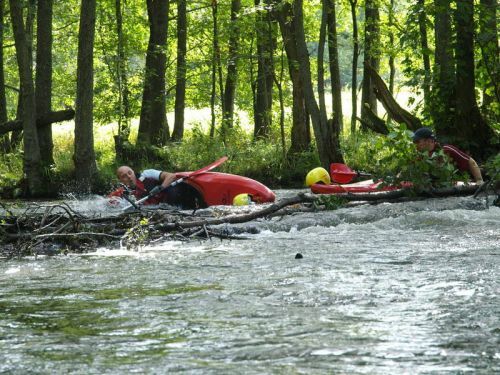 A moment of inattention or ill maneuver and you will end up in rushing cold water. 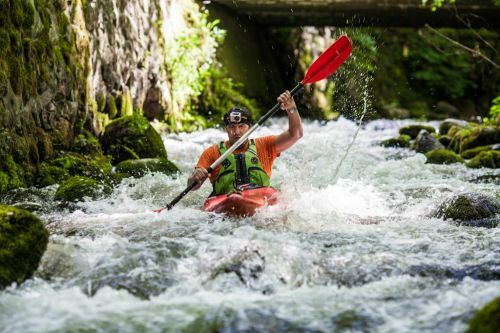 If you are looking for a kayak trip with small adventures on the way, you’re in the right place. 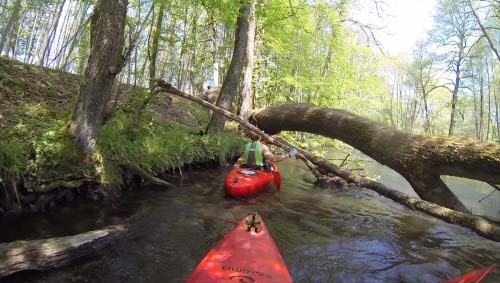 On this section of Słupia there are few fallen trees, fast current, necessity of towing the canoe due to the shallows, a few situations where you have to carry the kayaks and in the end there is the prize - a beautiful Lake Żukowskie with its unique fauna. That’s not all, look around carefully, because you can see the white-tailed eagle or wildlife approaching the water here. This is not surprising - after all, it is still the lagging of Słupia Valley Landscape Park. Łupawa in general is a difficult river and the section we present here is particularly hard. The adventure begins innocently - from lowland beginning behind the merger with Bukovina, through the great forest valley until we reach the first stone rapids at Czarna Dąbrówka. Then the river runs between the boulders. Peaceful atmosphere is deceiving, just behind Flisów Łupawa gains the momentum of a mountain stream. 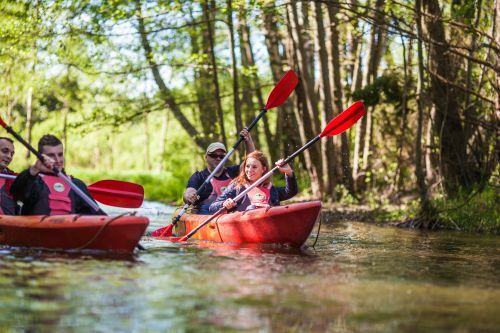 Do you lack kayaking experience, don’t feel like jumping on the trees, or pushing yourselves under them or simply leaving the kayak? 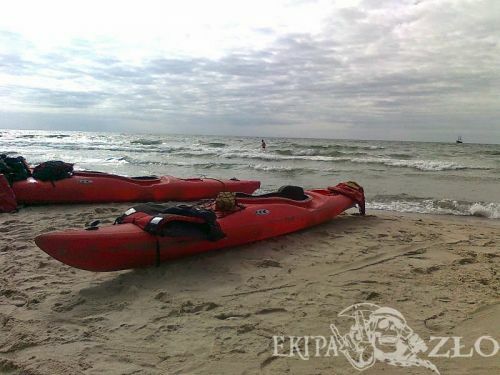 Do you crave for a moment of relaxation in a kayak? You have no problem with liquor consumption with the music in the background in a climatic place too? Then Wda is for you. Kayaking route for real tough guys. 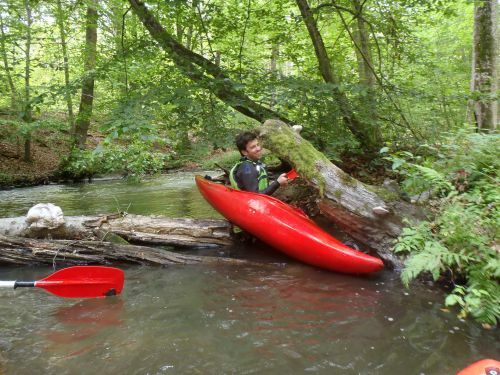 If you have already had some experience in kayaking, sometimes you like getting wet while facing "zwałki" (piled up trees) or rapids, we recommend you visiting the legendary Polish canoeing spot - Łupawa and its lesser-known but interesting tributary - Bukowina. Emotions and adrenaline are guaranteed. The route starts innocently, but with every kilometer more obstacles appear and you gain more experience. One of our few day long offers. 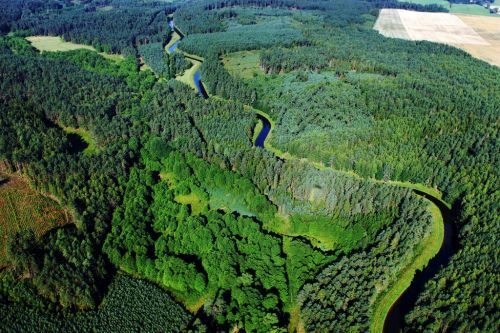 Route of 135 kilometer runs along one of the most beautiful and most diverse rivers of Pomerania, that is Słupia. On the way you will come across, especially in the middle part, so called "zwałkowe" sections, with piled up trees – in forest, with numerous trees and stone rapids. There are also several lakes that enrich the trip. Almost the entire route runs through the area known as the Green Heart of Pomerania. Are you looking for peace, adventure, nature? Wieprza is a route for you. It is little known, wild and sparsely developed. It lacks the big camping sites, tourist crowds and loud music. Instead there are vast forests, especially in the upper and middle section. On the way you can meet only ducks, cranes, swans, otters, deer, badgers and many other wild animals. 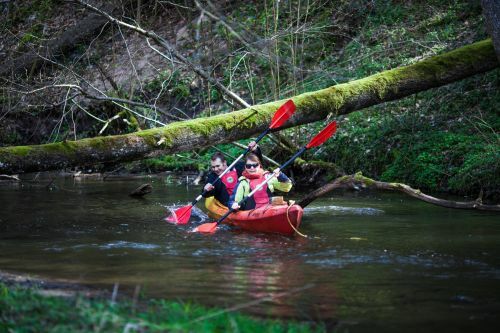 Wieprza and its tributary - Pokrzywna constitute a very attractive canoe route. It is quite easy and wide, only the upper section has a somewhat stone rapids and obstacles in the form of trees embedded in the mainstream.